How to install hurricane shutters both vertical and horizontal. Then how to properly remove your hurricane shutters. Your home's windows are probably different from that of your neighbors. So, why would you want the same Hurricane panels that they have? At DIYHurricaneSupply.com we customize the panels and tracks to fit your home's needs. This customization doesn't make the price shoot up because we receive the best factory direct pricing and pass the savings along to you. Plus since you'll do a DIY installation, there are no contactor costs to factor in. DIYHurricaneSupply is one of a kind in that it provides a custom product at a low price and it's all packaged together in a kit that fits your home's needs. The simple to use components: tracks, headers and slide-in-panels are easy to install. Your DIY Hurricane supply kit even comes with the hardware! Plus, we're here to help through the installation process start to finish with how-to videos, tutorials and live FREE tech support. please contact us; do not return any product before contacting us. 1. Locate any obstructions (such as overhangs or protruding windowsills) that may interfere with the installation of the shutters; the paneling will end at the obstruction. 2. Determine where to locate the bottom panel; it should overlap the bottom of the windowsill or doorframe by 2", if there is no obstruction. Mark location of holes to be drilled on side of building. 3. Drill a hole in ONE side only. Secure with a screw (a socket wrench may be necessary). 4. Before drilling any other holes, ensure the panel is level. Once this is complete, drill other holes (two on each side for non-BOCA hardware or four for BOCA hardware) and secure with screws. 5. Repeat steps 3 and 4; it is not necessary to use the level. Ensure that each panel overlaps the previous panel at least one rise. 6. Once the opening is covered by paneling, attach wing-nuts to secure the panels tightly. Removal: Remove wing-nuts and panels. Store together for easy reinstallation. Leave screws in place for reinstallation. 1. Locate any obstructions (such as overhangs or protruding windowsills) that may interfere with the installation of the shutters. You may need to locate the H Channel or F Track on the obstruction. 2. Drill holes (if they are not already pre-drilled) into H Channel (top) for securing it to the building. 3. 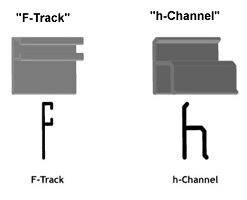 Measure the height of panels and determine the distance needed between the H Channel (top) and F Track (bottom). 4. Determine the location of the F Track below the window or door. (It may need to be secured to an obstruction. If the obstruction protrudes 1" or more, it may be necessary to secure a piece of wood below the obstruction to attach the F Track.) Attach F Track to the building with ONE screw as close to the middle of the F Track as possible. 5. Ensure F Track is level, then attach additional screws, starting at the center and moving outward; secure with wing-nuts. Match up panels with track and slide F Track bolts into the track at each of the pre-drilled holes in each panel; overlap panels by at least one rise. Secure with wing-nuts. 6. Determine the location of the H Channel above the window or door. (It may need to be secured to an obstruction.) Attach H Channel to the building with ONE screw as close to the middle of the H Channel as possible. 7. Ensure the H Channel is level and finish inserting screws. Secure with wing-nuts. 8. Insert top of panels into the H Channel. Removal: Remove wing-nuts and panels and slide bolts out of F-track. Store together for easy reinstallation. Reinstallation: Match up panels with track and slide F Track bolts into the track. Overlap panels by at least one rise and secure with wing-nuts. Insert top of panels into the H Channel. Note: For either installation method, panels can be overlapped by more than 1 rise, but should always be overlapped at least 1 rise for the most effective installation. Note: Special situations (such as protruding windowsills, overhangs, etc.) may require minor adjustments to the above instructions.